Ginza is among the world’s premier commercial districts. Last spring, I spent some time walking all around Ginza for an article I happened to be researching at the time. What I realized once again, after touring the district on foot, is that Ginza is very amiable—its scale is very human—which somewhat belies its image as an iconic, global commercial destination. If you leave one of the bustling main streets and walk down a side street, you’ll find a host of unique stores. Public bathhouses still operate in the 1-chome and 8-chome areas at the district’s edge. This diversity of streetscapes is one of Ginza’s appeals, something I realized all over again as I went about my research. Ginza’s largest retail complex, GINZA SIX, has a humming hustle-and-bustle feel, as if its dignified façade housed yet another district. It’s a place that makes you want to wander around. GINZA SIX is like another district that’s come to life within the district of Ginza. Since I plan to enjoy a nice stroll, I decide to start by spending some time on my appearance. 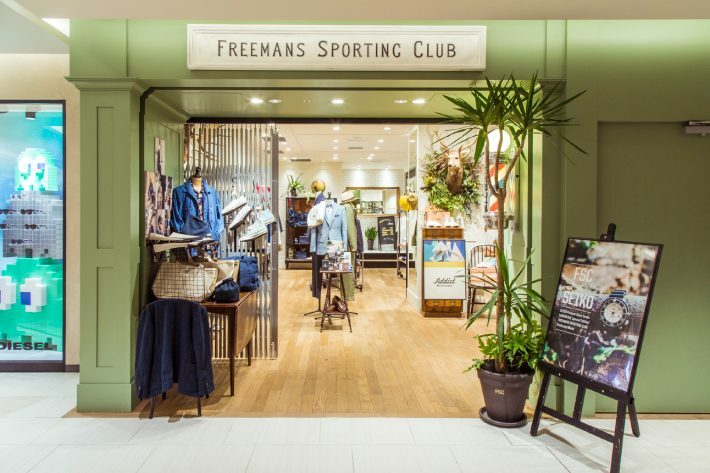 I head to Freemans Sporting Club on the fifth floor, a branded boutique and barbershop that pursues an “American trad” look and operates a flagship store in Manhattan’s Lower East Side. The New York flagship store began as a restaurant that went on to open a clothing boutique and barbershop. 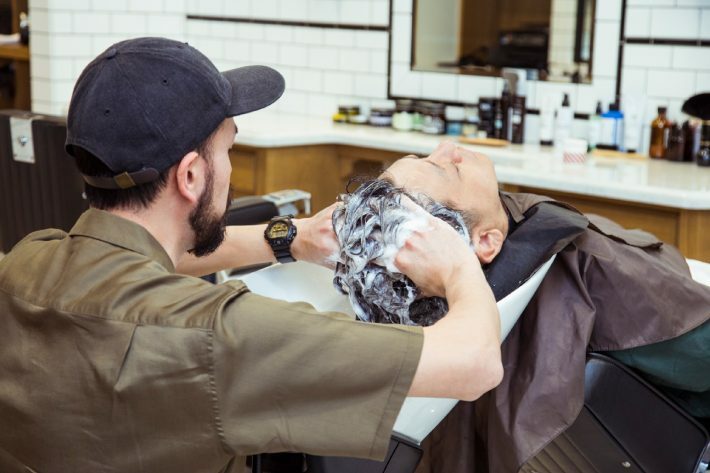 That store, it’s said, pioneered the authentic barbershop style that’s now a worldwide trend. 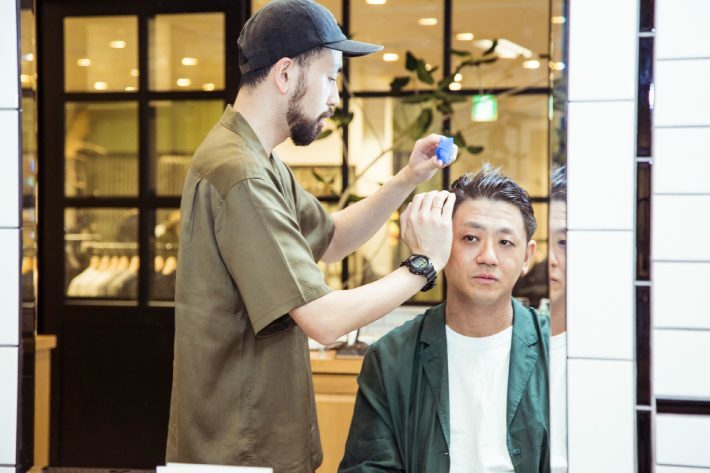 You can, in fact, experience the barbershop service at GINZA SIX. Unfortunately, I’d just had my hair cut recently. Instead, I decide today to get a shampoo and shave (5,000 yen; all prices listed before tax). The barbershop space at the back of the store is covered in subway tile, the same type used in New York’s subways. I’m led to my chair and sit down in a Belmont barber chair imported from the US. For my work, I often do a lot of research on furniture made by designers. But I was tickled once again by the design of this chair for professional use, a chair made with utility in mind. 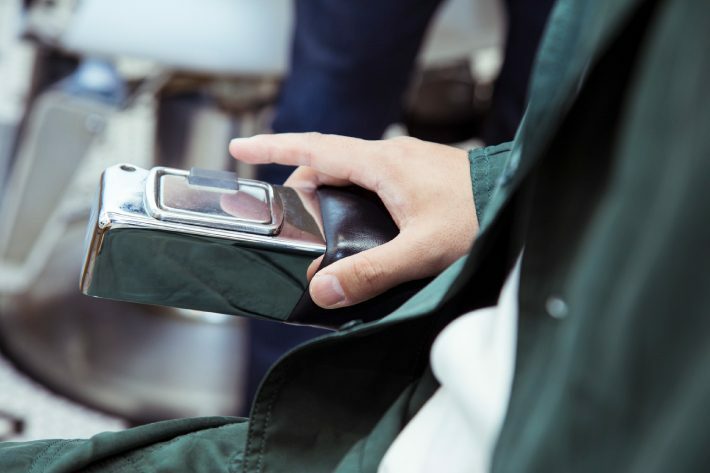 The vintage, seasoned expression has an undeniable appeal, like a barber chair found in a search for barber chairs specifically for this barbershop. I place my arms on the armrests and discover an ashtray at the end. The shop, of course, is nonsmoking, but this particular detail inspires a sense of nostalgia for the barbershops I went to as a kid. 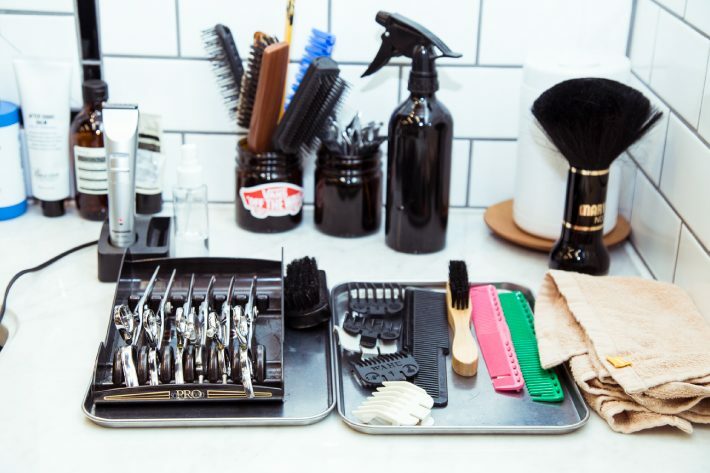 I’m not getting a haircut today, but I take note of the scissors, combs, and various hairdressing products lined up on the counter and find myself staring at the counter like a child. First up is the shampoo. I’m a bit tired from several consecutive business trips and find myself dozing off while receiving a vigorous and highly pleasant scalp massage. But the fresh aroma of the shampoo wakes me up. My interest piqued, I ask about the shampoo. 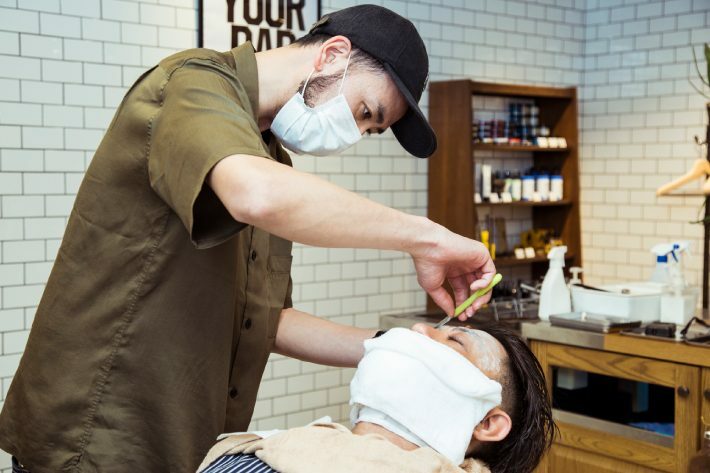 I’m told it’s from Blind Barber (3,500 yen), a café-barbershop in the US. The lemongrass aroma is distinctly pleasant, and the sensation as your hair is washed is refreshing. I hear the shampoo can also be used as a body wash, so I’m thinking I’ll switch to it as soon as the shampoo at home runs out. The shave I receive next is also very soothing and, once again, I fight the urge to doze off. I notice that the small trouble spots that are so tough to shave yourself receive their share of due care. This, and some exfoliation, leaves my skin feeling much improved over a regular shave. Lastly, I request styling and consult with the barber on how to get my hair to look just right. I have fine, soft hair and have had trouble getting it to look its best. Today, I discover the shop’s original pomade is a great match. 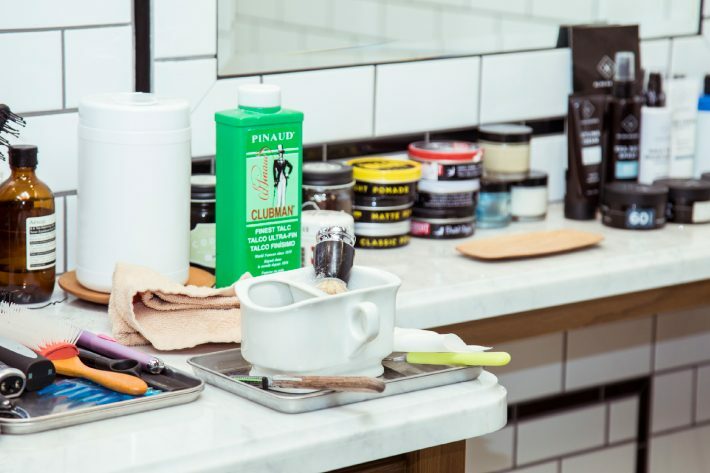 This barbershop would make for a wonderfully luxurious start on days you dress up and head out. 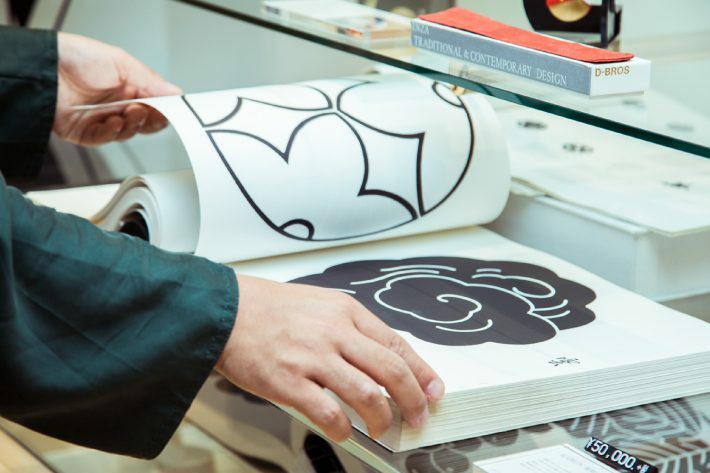 I next head to D-BROS on the fourth floor, a shop operated by the design firm Draft. Known globally in the graphic design and advertising industries, the firm launched D-BROS, its product brand, in 1995. Many people will instantly recognize the plastic flower vases, even if they don’t know the brand name. 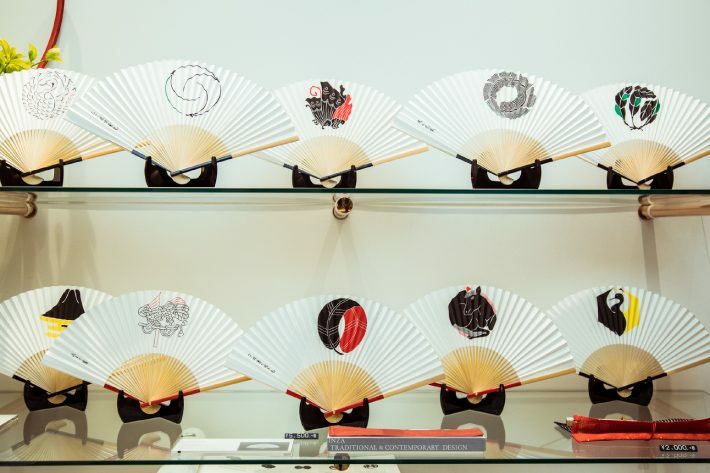 The brand has strong associations with the cute and pop culture, so I was surprised to learn they’d started a new project in Ginza, integrating graphic design and traditional crafts. Then again, when you look at the products in the store, you immediately see this as a quite natural development. Japan’s traditional family crests were important graphics that identified family clans with long-standing roots in the country. Transcending time, their robust, unique forms retain their appeal today. When I hear traditional, I tend to think lofty; but one purpose of design is to update the traditional in line with the times. The work done by Draft renews the appeal of these family crests. Despite their status as classics, they now feel, in some way, fresh. In particular, the fans bearing these crests are eminently practical. I can recommend them for the upcoming summer season. 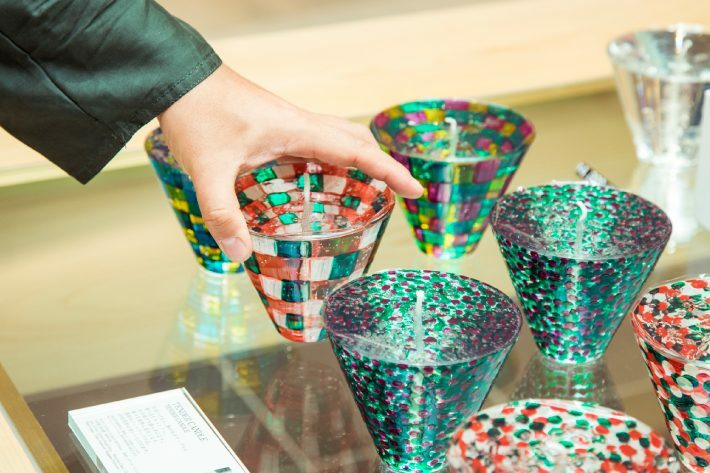 These glass candle holders feature glass hand-colored by Draft’s designers. The glass patterns reflect the shimmering flame the moment the candle is lit. I find myself thinking immediately of buying one to present as a gift. My last stop is the food floor on the second belowground floor. 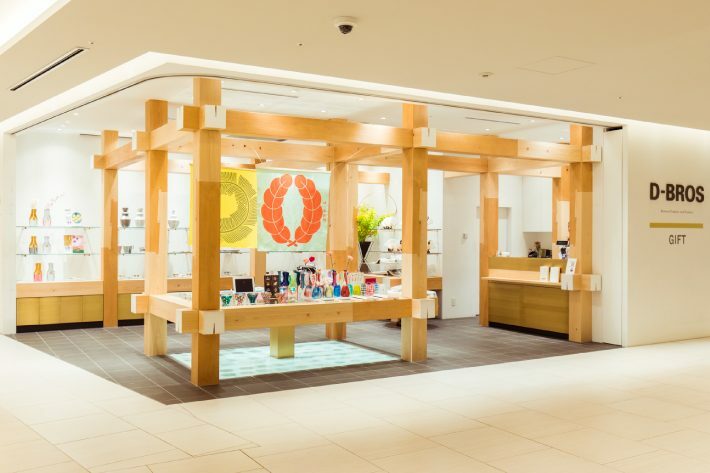 For many of these stores, the Ginza Six location is their first in Tokyo. 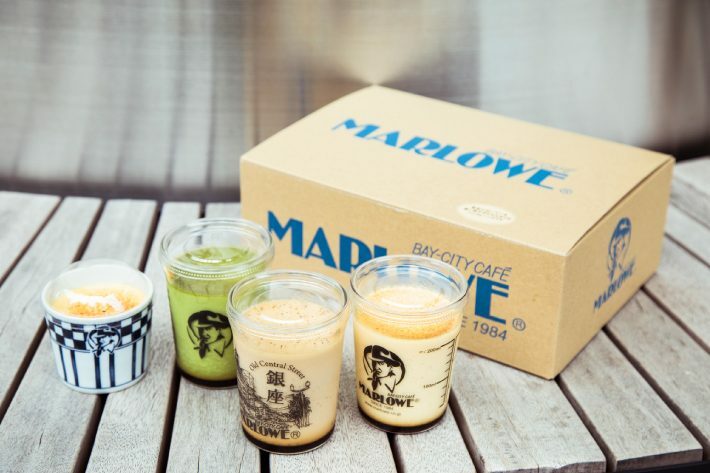 I try the pudding from Marlowe of Hayama, recommended by a friend who knows I have a sweet tooth. The puddings come in many flavors and incorporate ingredients like mangos and seasonal fruit. I end up unable to decide and go with four different flavors: standard custard, lightly sweetened matcha, limited GINZA SIX royal milk tea pudding (in a beaker decorated with Ginza scenery), and brûlée, made with Hakkaisan sake. As a matter of course, the shop’s namesake Philip Marlowe, the fictional detective created by the author Raymond Chandler himself, adorns the standard beaker. Tempted to begin eating at once, I head up to the second-floor terrace. 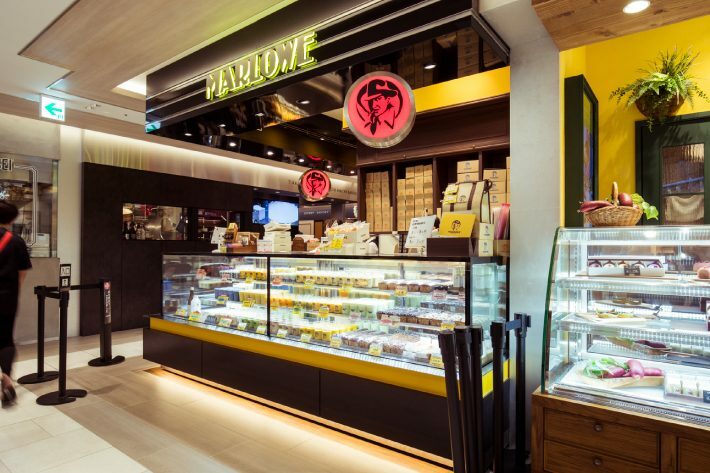 I lay out the four flavors amid a relaxing space one would hardly believe could be found right in the middle of Ginza and proceed to dig in. The custard is smooth on the tongue. I enjoy the rich vanilla bean aroma, and the amount provided is quite satisfying. To this, the Hakkaisan brûlée adds a note of sake. Amazing. The rich sake flavor is stronger than I’d expected, enough to stir inner suspicions I was up to something, here in midafternoon, not quite respectable. Setting out with a specific objective is certainly fine, but I also recommend enjoying a stroll through the district known as GINZA SIX. Get your hair cut, walk around looking at clothes and crafts, take in some art and books, and enjoy some food from the basement. The underground shopping area offers a collection of stores from all over Japan and can be enjoyed much the way you would wander down narrow side streets. On your way home from work, stop by to enjoy some sake. It’s the perfect plan. 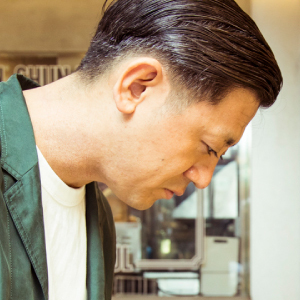 A district within a district germinated and flourishing in Ginza. Isn’t that GINZA SIX in a nutshell?